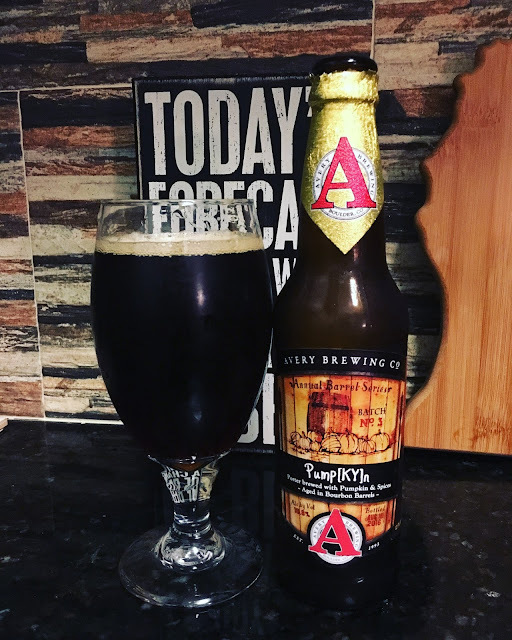 Recently, I gave a couple of bottled bombers to a friend of mine, and he was charitable in giving me a bottle each of Avery’s Rumpkin and Pump(KY)n, their crazy-high ABV pumpkin beers that are available from August to October. Clocking in at 17.5% ABV, this and Pump(KY)n are the booziest beers I’ve ever drank. But despite that high alcohol content, it doesn’t completely taste like booze, like some beers I’ve had clocking in at over 8%. It’s amber in color, but still dark. You can taste the pumpkin and molasses, along with hints of rum, as it was aged in rum barrels. Yes, Rumpkin costs $13-$15 a bottle, but it’s one of these slow sippers that you should buy and drink at least once. Even as it warmed up a little, it still tasted great, like a good Belgian Quad. This beer is an ale, not a porter like Pump(KY)n.
Avery’s Pump(KY)n has a very high ABV of 18.8%, and like Rumpkin, it’s a slow sipper you enjoy at home, at least that’s what I did. I also made sure I drank this one a couple of days later, so I could experience it fresh, and not after Rumpkin. This one is aged in bourbon barrels, and I really like that the booze doesn’t dominate the beer. I definitely could taste the pumpkin in this porter, but make no mistake, it is boozy! Both of these beers aren’t cheap and are usually hard to come by (I’ll touch upon that soon), but I recommend trying both. I know Beer Drinker Rob isn’t a big fan of Pumpkin Beers, but I love them. By late October, I’m sick of them, but I always enjoy drinking them. I wish the breweries would start releasing in early September vs. August, to really let people enjoy this annual fall beer staple. One final thought on pumpkin beers: In an article last year, I read that the pumpkin craze (coffee, muffins,beer, etc.) may be on the decline after peaking around 2012-2014, though this year you can see a ton of pumpkin-related items. But pumpkin beer might be slowing down. It appears over saturation is to blame, and it was evident in 2015, as beer fans and I saw a lot of pumpkin beers sitting on shelves well into the winter beer season, including some more in-demand beers I would have thought were hard to come by a few years ago. Another reason could be that many pumpkin beers taste alike, some aren’t all that good, or have a high ABV and all you taste is booziness, but no pumpkin. 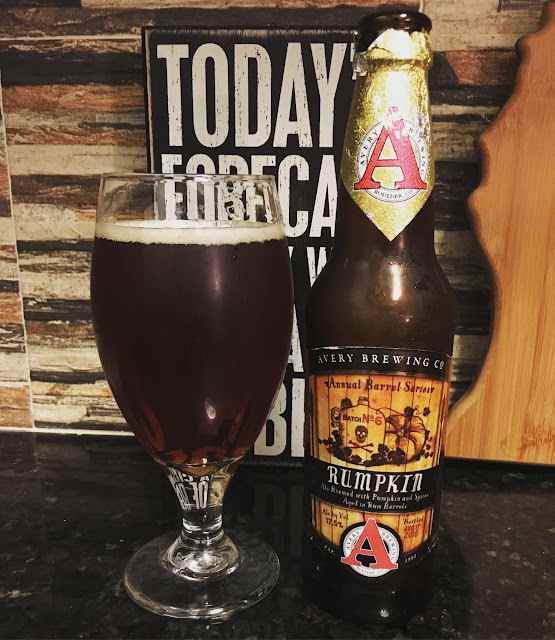 This year (2016), I was surprised to see both beers from Avery, along with Cigar City’s legendary Good Gourd, still sitting on shelves in my area. The Avery pumpkin beers, despite being priced in South Florida at $13-15 per 12 oz. bottle, would always sell out fast and are considered a rarity. And I was actually stunned to see over dozen bottles of Good Gourd at a local beer, liquor and wine store, and a local craft brew shop owner told me they weren’t selling Good Gourd out as fast as before, despite constantly posting about it on social media. They’re sold out now, but it took several weeks. This all makes me think we’ll see smaller production and shipments of many different pumpkin beers in 2017, with the exception of Shipyard’s excellent Pumpkinhead, which I consider is my gateway beer to craft when I first drank it in 2010, on a suggestion by our own Ed Roberts.